In THRONE OF BLOOD, Shakespeare’s Macbeth is retold in medieval Japan; conquering armies, witch prophecies, grasping leaders and their conniving wives. Just another day in Washington. Akira Kurosawa directs this tale of treachery, betrayal and ambition with a terseness that reflects the clipped consonants of the Japanese language. Curt, sharp scenes, with no frame wasted. We are headlong into the plot immediately as Washizu (Mifune) and Miki (Akira Kubo), two Captains of outlying forts, navigate through a labyrinthine forest to the Emperor in Forest Castle, after repulsing invaders. A spirit appears to them and foretells that they will both receive major promotions this day, with Washizu soon becoming the Emperor of Forest Castle and Miki’s son one day attaining that post. Now if you’re thinking rationally, anyone could foretell such an event: being the Captain of Fort One, Washizu would probably rise to the throne anyway in a natural progression of events; and Miki’s son would probably rise to that same throne after a number of years because the young will replace the old – another natural progression – and if Washizu had no heirs, he would probably look no further than the trusted son of his best friend to replace him… But who thinks rationally in a Shakespeare joint? While the Emperor innocently visits Captain Washizu while on a hunt, Washizu – fearing a plot against his life (obviously because he harbors those thoughts toward the Emperor) – murders the Emperor in the dark of night. Blaming unknown assassins, he ascends to Forest Castle. Now the prophecy of Miki’s son’s ascension haunts him. And the slope gets slipperier and slipperier. 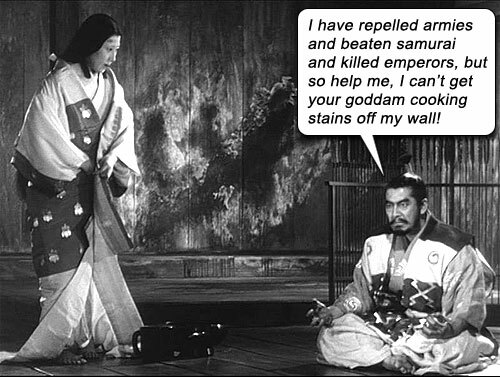 Toshiro Mifune rages through THRONE OF BLOOD. He is a towering presence, noble of aspect and regal of visage, embodying the presence of old world Emperors. He and his wife live in a paper house bare of everything except four walls, she just sitting in the middle of the empty floor. (What did people DO in those days?) That frown of his, those piercing hawk eyes, that mustache so sharp it has claimed the lives of more men than his katana. Having already portrayed samurai in many films to this point (SEVEN SAMURAI, the Musashi Miyamoto series), like Robert de Niro many years later becoming the face of the Mobster, like John Wayne becoming the face of the Cowboy, Mifune had by this time already become the face of the ronin swordsman (and more samurai films would follow to cement him even further: YOJIMBO, SANJURO, SAMURAI ASSASSIN). He inhabits the role of warrior like buttah, and every aspect of his bearing exudes that samurai ethos of least exertion and maximum efficiency: those panther moves, the jagged vocal delivery, and that magnificent straight run. 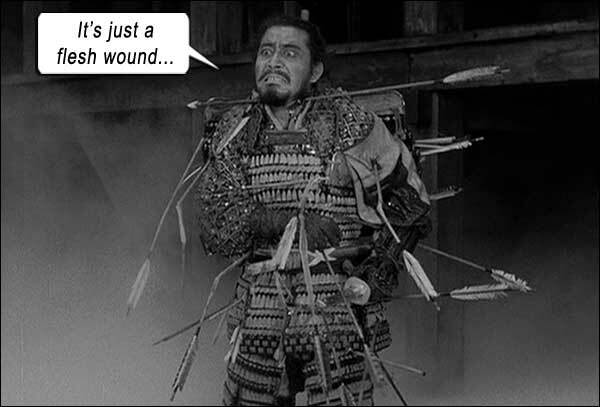 THRONE OF BLOOD was created in 1957, and its excellent practical effects stand up to this day. It’s most iconic scene – Washizu bragging and screaming like SCARFACE and being skewered by hundreds of arrows instead of bullets – is still a wonder to behold, and still a mystery on how it was achieved. It is said he was “murdered by ambition.” Then why don’t politicians in Washington die quicker? Writers: Hideo Oguni, Shinobu Hashimoto, Ryûzô Kikushima, Akira Kurosawa, William Shakespeare. Starring: Toshirô Mifune, Isuzu Yamada, Takashi Shimura, Akira Kubo, Hiroshi Tachikawa, Minoru Chiaki, Takamaru Sasaki, Gen Shimizu, Kokuten Kôdô, Kichijirô Ueda, Eiko Miyoshi, Chieko Naniwa. b/w, Japanese with English subtitles.